Confluence Gallery and Art Center presents the 17th Annual Methow Valley Home Tour “Building in the Land of Sun and Snow” featuring homes and cabins that balance practical and environmental demands with designs that mirror the unique beauty of the Methow Valley. This 17th Methow Valley Home Tour features designs that balance the practical demands of this unique environment with aesthetics that mirror the natural beauty of the Methow Valley. The homes on this year’s tour distinctly display a sense of place. Tickets: $25 per person or $20 per person for car pools of four. 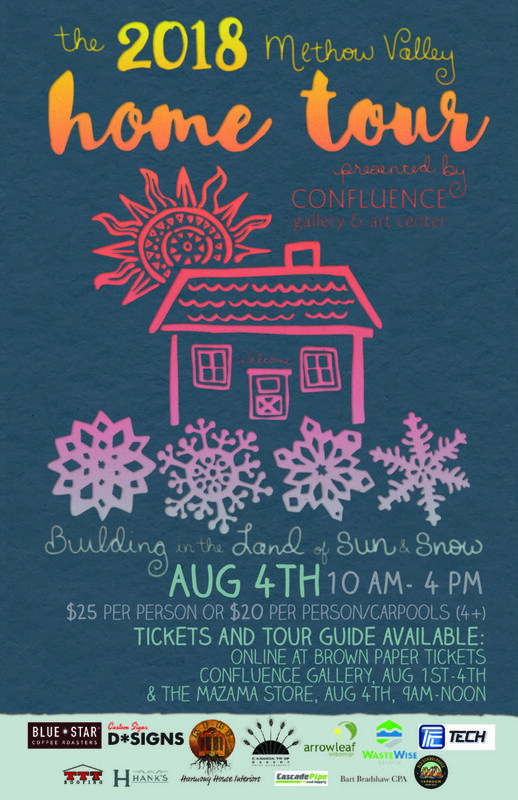 Tickets with a tour map go on sale at Confluence Gallery July 30 – August 4th. Tickets with a tour map go on sale at Mazama Country Store August 4, 9am – noon. Tour goers can also purchase tickets at Brown Paper Tickets online, at the Gallery or over the phone (509) 997-ARTS (2787).